I have not checked for roots yet. I don’t wan to mess with the bags for a full month. I’ve just bee looking for bud swell. I kept all of my buds above the medium so I can check them just looking trough the bag. You are right that there may be several differences between the groups. The first group did not have root radicles, but they are nuts I cold stratified myself and I know they had enough time. The second group all had root radicles. I think the biggest risk is compatibility between Seguinii scions with Dunstan nuts. The other difference between groups is the first group has relatively large nuts with about 1/8th inch scions and the second group has small nuts with larger scions. It will be a fun experiment whether it works or not. At least one of the first batch has put up a small diameter shoot. It is now an inch and a half tall. I’m presuming that nut has rooted or close to it. That nut had the same amount of cold stratification as the rest, so maybe roots are forming on the others. I’ll report back as things progress. Great, pictures would be nice, when you have something to show. Pictures are ALWAYS nice, grin. Will do. Don’t have anything to show on Seguins yet, but I could always post GRIN pictures, grin. 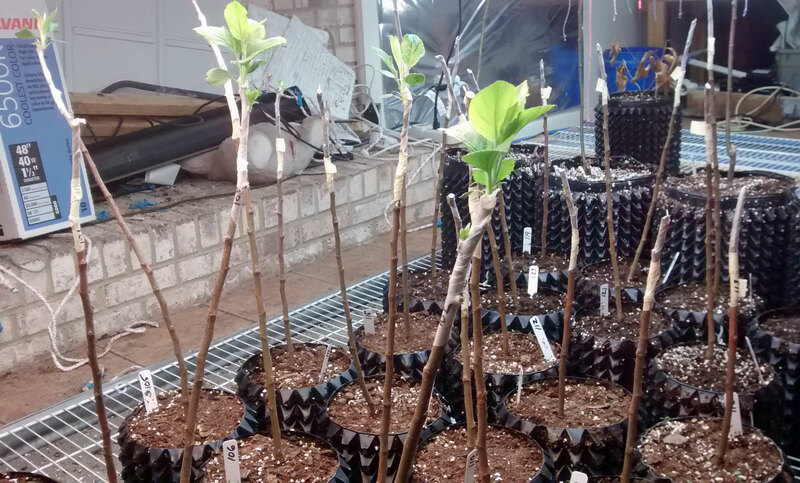 My apple grafts are just starting to leaf out. The other day I wanted spring so bad that I went into a local greenhouse just to smell the warm earth, sniffffff, sigh, heaven! Here is what happens when you split the nut when inserting the scion. The petioles root as usual, and the split nut partly opens up. 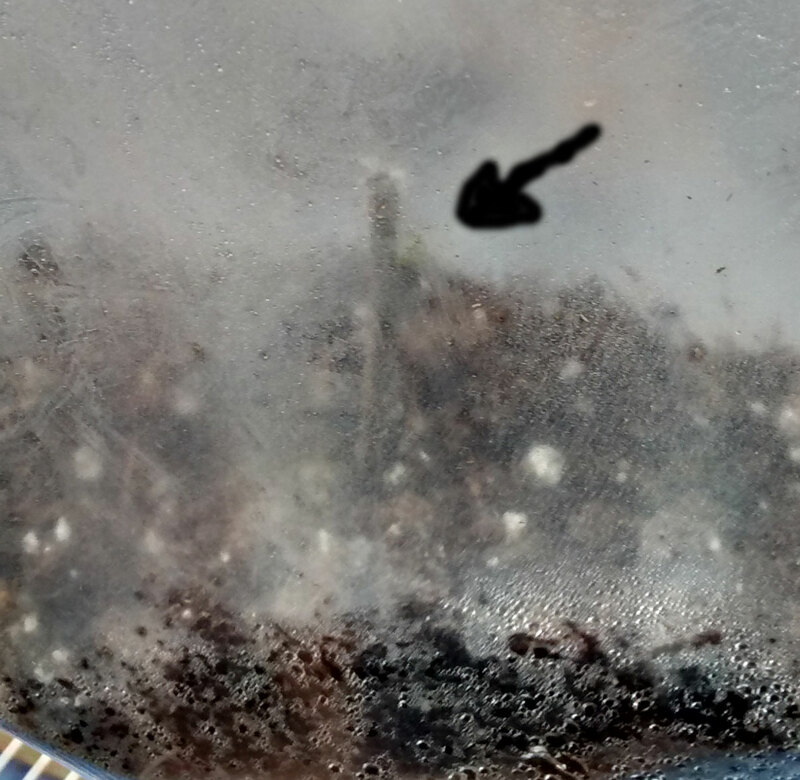 The insertion point has callous between each cotyledon and the scion, so doesn’t open at that point. The little guy is in our woods now and 15 feet tall, so don’t worry too much over a split nut. That is good to know since I’m sure I split several in the second batch! Wah Hoo! I think so too. It’s at the right location and angle for growth. 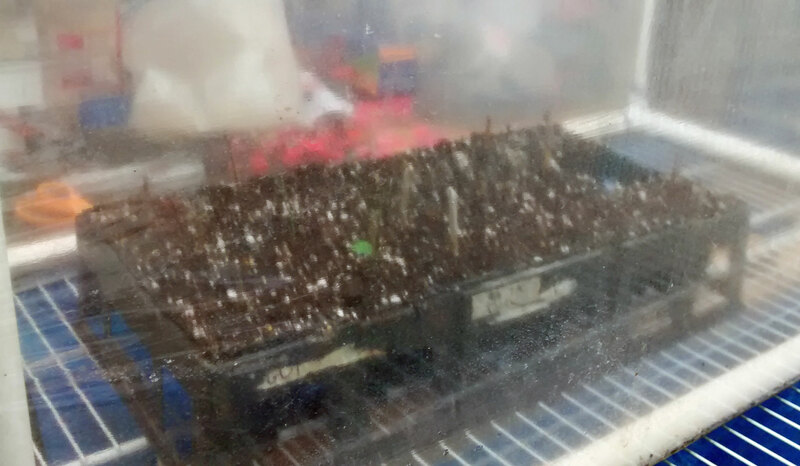 Roots will show up against the sides of the plastic soon too, quite noticeable soon. 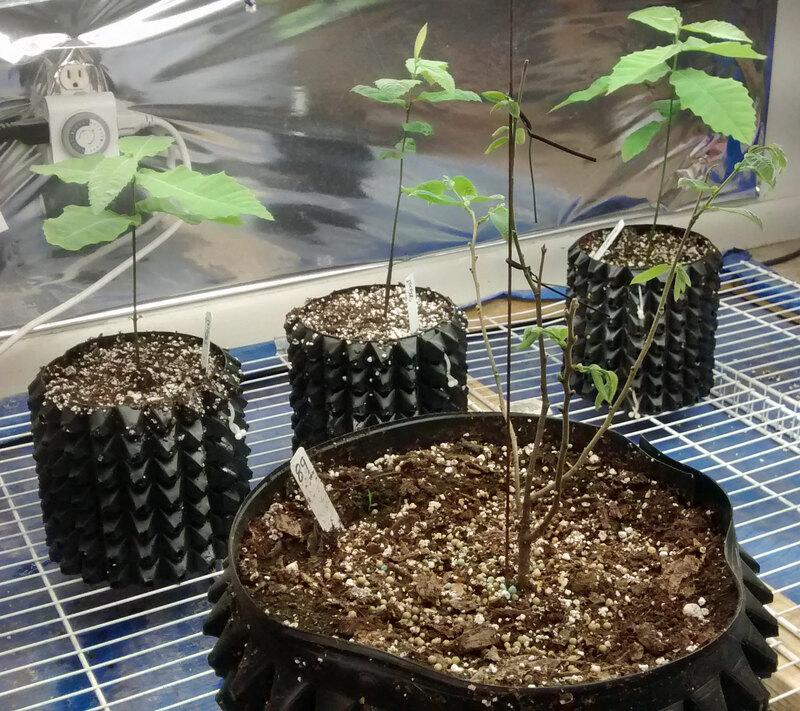 In 5 more days I plan to remove the first batch, put any with roots into Rootmaker 18s, and them put the in my misting chamber. Well, it has been a full month since I did the first set of Seguin to Dunstan nut grafts. So, I decided to take them out of the plastic bags and put them in 18s and the tray in my mister. Even though the second set won’t be in the bags a month until the 24th, I decided to move them all at once. 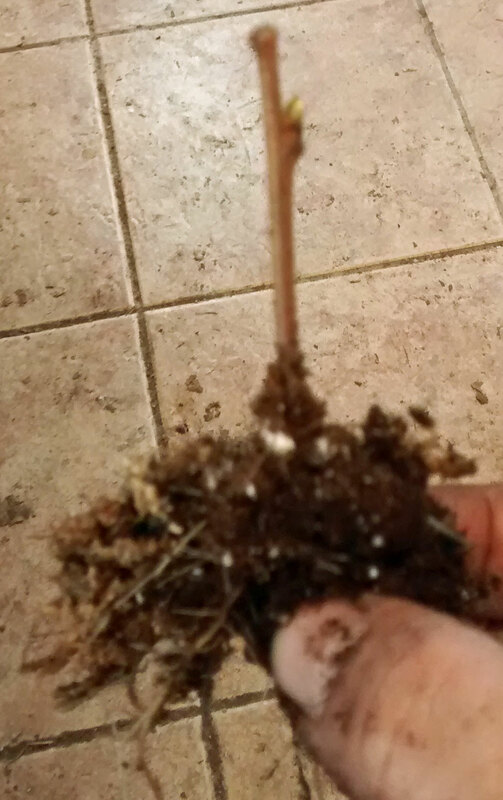 It has roots and a green bud. One had no roots and mold and the nut was soft. I culled that one. All of the other nuts in the first batch had roots. Two of them had no green buds and had put of top growth. Those will be Dunstans if I don’t cull them later. The rest in the first batch had roots with no green buds yet. In the second group none had green buds and none had put up any shoots. Most had roots. 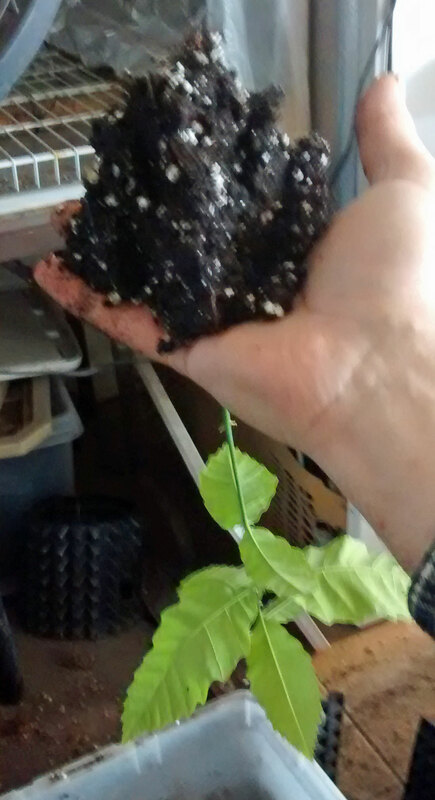 A few had no roots yet but the nuts were solid and showed no signs of mold. I set the mister to mist for 1 minute every hour. I hope this enough to keep them at the right humidity level. There is some good and bad news for my seguins. The nut grafting does not look promising. The one that had the green bud is not dead yet, but nothing else is showing any signs of life. The good news is with the seedlings. I scraped a little medium off the cell with the 4th seguin that had not shown top growth yet. I could see a tap root, so I’m not counting it out yet. 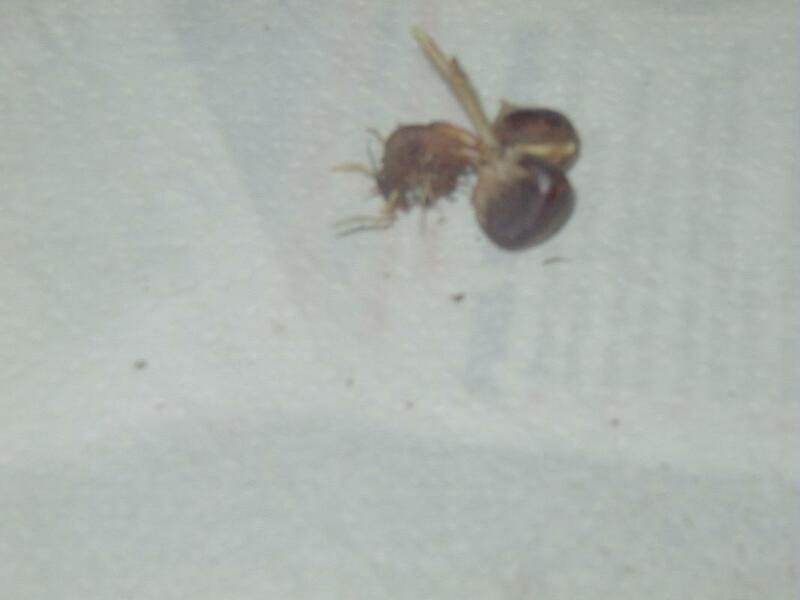 I’m going to let the nut grafts in the mister stay for another week or so, but I think the nut grafting is a failure. The one with the green bud has now turned brown. I’m sure some failed because of poor technique, but I’m guessing incompatibility between Seguins and Dustan was a big factor as well. 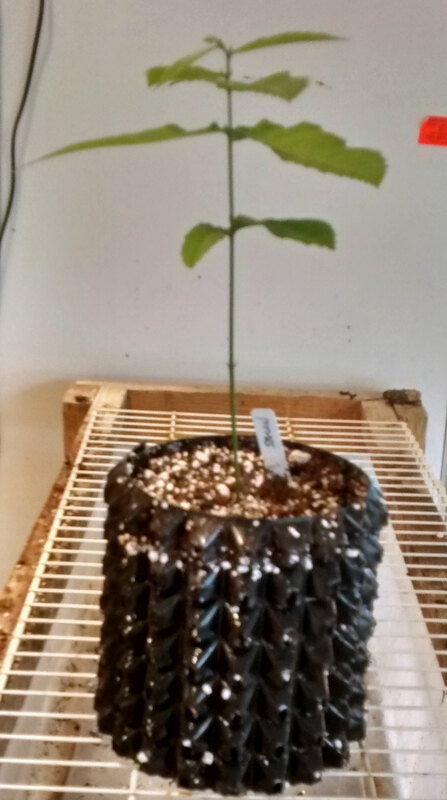 On the up side, the 3 seguin seedlings are doing very well! 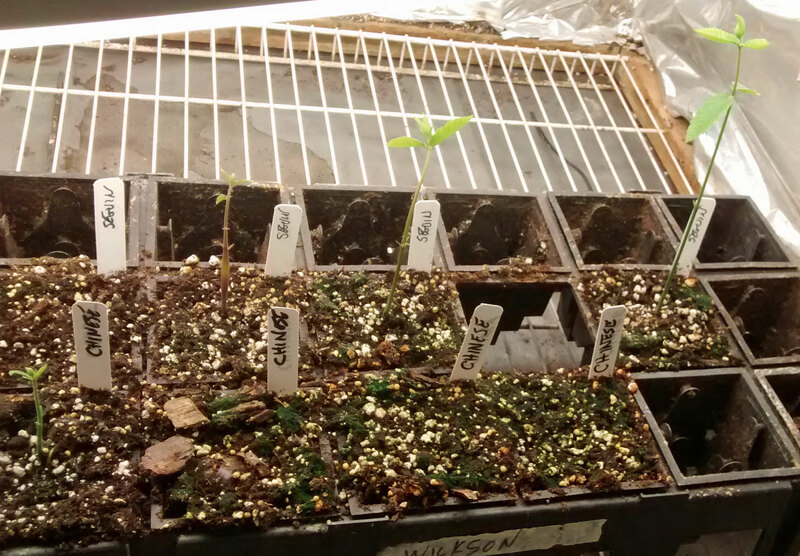 The three in the back are the transplanted seedlings. The tree in the 3 gal in the front is a seguin seedling I grew from a nut last winter. The reason I put seguin in quotes for the seedlings in the back is that I’m now having second thoughts. I’ve only had success growing seguins from nuts one time and that was last winter. I then got some disease that killed all of the seedlings except the one in the 3 gal container in the picture above as well as the parent trees. When I received the nuts this year, there were two bags with 4 nuts each. One bag was Chinese and the other seguins according to the kind gentleman who sent them to me. I’m now wondering if I got them mixed up. Only one that I marked Chinese has germinated and 3 of the 4 I marked Seguin germinated. I was amazed at the great growth of the ones marked seguin compared to the ones I grew the previous year. I’m now thinking I got the nuts mixed up and only one is a seguin. It has tiny leaves. At first, I presumed it was some mold issue or the medium was too wet for too long that caused it. I’m now thinking it might actually be the Seguin! When I look at the leaves on this and the new leaves starting on the seguin from last year, I’m beginning to believe I have 3 nice Chinese and 1 little Seguin. 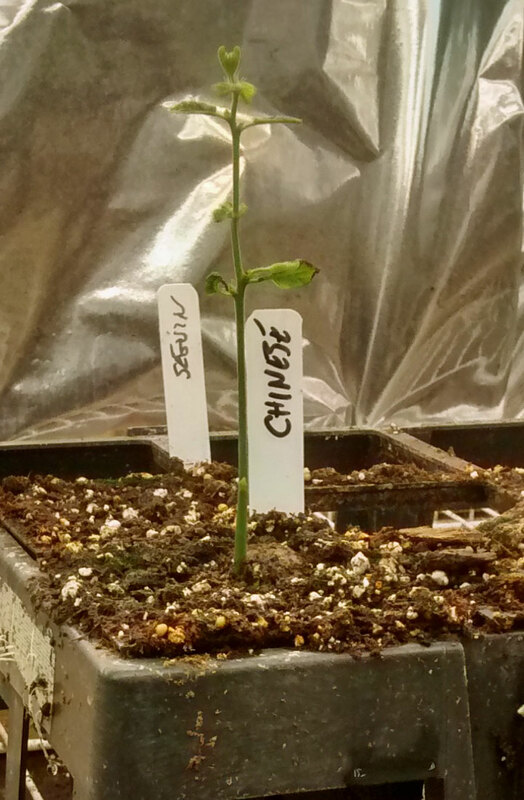 The three in the back do look chinese to me, however I have never seen a Seguin seedling before so take my opinion with a grain of salt.